Home » Do Gender & Age Influence Engagement? 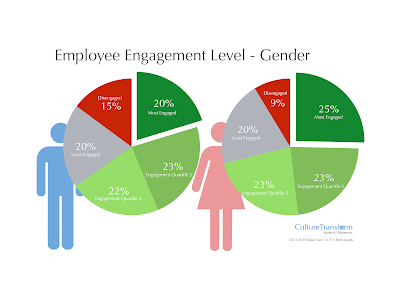 I’ve had some follow up from my last blog on employee engagement, which raised some interesting questions around gender and age, so this one aims to dispel some of the common myths on the subject using 13,000 sparkling data points (otherwise known as people). Those of a ‘non data’ disposition should start to panic now, or at least skip to the summary at the bottom of the page. So why bother with all this analysis? Primarily to save money and time – if you’re aiming at saving a few million pounds (see here for details), it’s nice to do so as efficiently as possible and target the right groups. Myth 1 – men and women are just as engaged (or disengaged) as each other, everyone is an individual. Wrong. Sort of. In the last blog I divided the population into four segments (plus one for the totally disengaged). Mapping the gender distribution gives the chart below. The ‘middle’ of the engagement spectrum remains the same. But there’s a very large difference at each extreme. A higher population of women occupy the ‘highly engaged’ quartile with 25% of the female population in that quartile compared to 20% of the men. Also take note that almost twice as many men reside in the ‘disengaged’ segment. We’ll explore some possible reasons why later on. Myth 2 – younger people are more engaged than older people.Ermm…..sorry, no – wrong again. 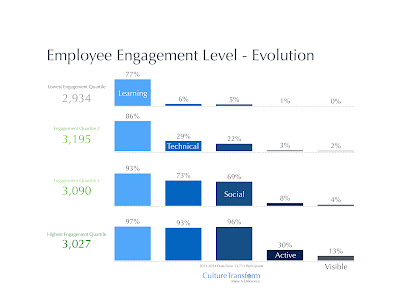 In fact the opposite holds true, the more advanced in years, the more likely you are to be a highly engaged employee. If you’re looking for the most engaged employees in your company, then you’re likely to find them in the ‘over 40’s’ section of the population. Strangely, the 40’s group has (marginally) the highest proportion of disengaged employees too, but there is a clear progression of engagement as the population gains maturity. Myth 3 – everyone has their own way of getting engaged with the company.No. Not true, in fact there are a few very straightforward and simple options that engage people much faster than you might think, and they are unlikely to be the ones you imagine (I could write a whole new blog on the myth of internal social media). Here’s some simple theory before we go much further. Typically people get engaged in five different ways – most of which are available (and measurable) in one form or another at every company. There are learning opportunities – these are not limited to formal education programs, but rather learning about why there is a focus on employee engagement. Most companies are trying to improve this, but few communicate effectively what they are doing about it and why with the population. There are technical opportunities – typically involving multiple interactions with technical infrastructure, such as the intranet. Social opportunities also exist, voluntary interactions between individuals and groups within a company which may or may not be related to internal social media platforms such as Yammer and Chatter. Active engagement opportunities involve more visible volunteering or action based giving within the company – going out of the way to give help or recognition to others. Finally there are visible factors, people who are recognised by others for their contributions. These are the hardest to measure, but often take the form of awards and recognition by peers and colleagues for their help, expertise or support. Examining the engagement quartiles for our population shows a very distinct pattern of evolution. 77% of the least engaged group has engaged in some form of learning, but very little else. Our most engaged group are participating in learning, technical and social engagement, and almost a third are showing active participation in driving the company forward. 13% are being recognised by others. There is a clear evolution of engagement through each of the five as engagement increases. The take home from this? Make sure you’re communicating effectively why employee engagement is important and what it means to everyone. From that seed, other forms of engagement will grow – but if you can only do one thing, make sure that this one is done well, if only because it is the most accessible to the highest number of people. I would encourage only data geeks to continue from this point in. Remember that we’re trying to make more money than the competition by having highly engaged employees – everything else is a waste of time. So in order to do this right, we need to really look at the population to and see if the quick theories described above work on a more granular level. Get this part right, and planning the next phase of your engagement project becomes more cost effective – because it will work. 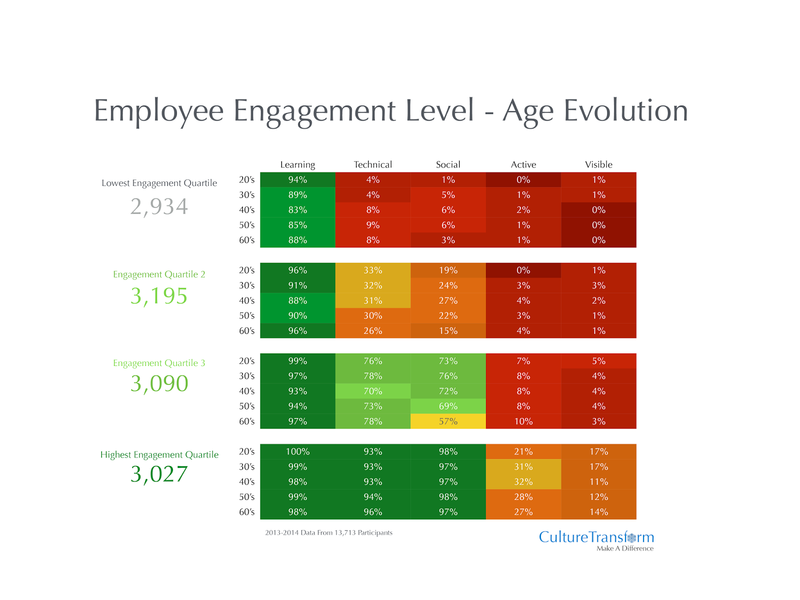 In theory then, the most engaged employees are older, and gender makes no difference. Everyone can get on board with an engagement learning program, but very few become the visible evangelists. The charts below bear that out. We have a couple of slight anomalies, most notably with the over 60’s in quartile 3 demonstrating a lack of comfort with the social factors compared to their younger colleagues (that’s the yellow 57% block) – and those men in their 20’s who refuse to engage socially (the red 1% block on the top line). 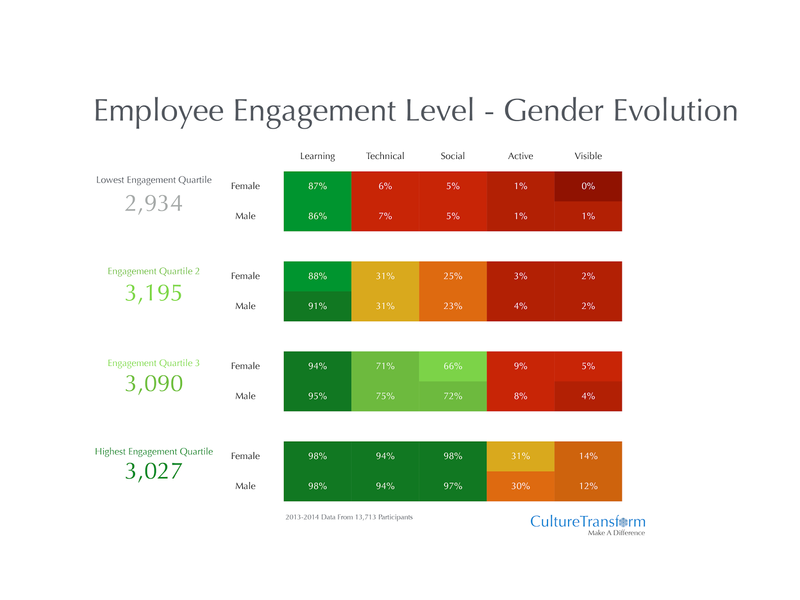 The final chart shows the gender balance – and as before, regardless of quartile, the engagement factors remain the same. The conclusion? Stop worrying about different age groups and genders interacting in different ways. The fact of the matter is (with the exception of men in their 20’s) – this particular population all behave in a similar manner. Many of the tools you need to create better engagement already exist in your company – the technical infrastructure, social enablements and the opportunities to participate are all present, but without creating an environment of understanding even your best efforts are doomed to failure. Then go and ask a bunch of 20 something males why they don’t like the internal social systems…….